Sri City, January 31, 2019:- M/s Thermax Ltd., a leading energy and environment solutions provider, inaugurated its state-of-the-art manufacturing facility in Sri City on Thursday, marking the beginning of construction of its production unit in Sri City. 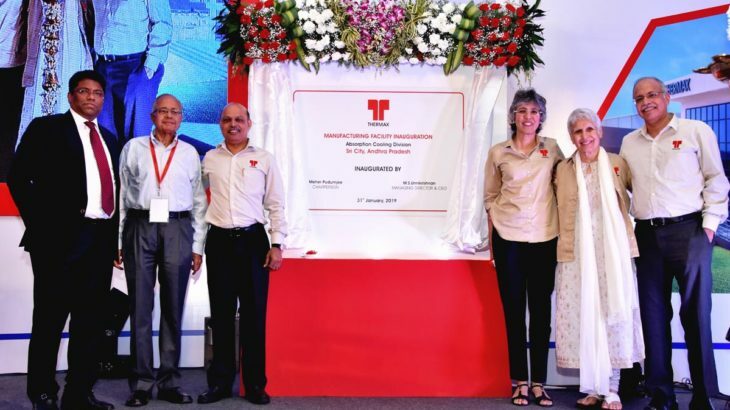 In a colourful ceremony held at the company premises, Ms. Anu Aga, Former Director, Thermax Board administered the inauguration in the august presence of Ms. Meher Pudumjee, Chairperson, Thermax Board, Mr. M.S. Unnikrishnan, Managing Director & CEO, Thermax, Mr. Ravindra Sannareddy, Founder Managing Director, Sri City and Mr. Raghavendra Rao, MD, CRIL. The plant, which was built on a plot of 40 acres in the Domestic Tariff zone in Sri City an initial investment of Rs. 166 crore, has the capacity to produce 400 machines per year and provides employment opportunity for about 300 persons. The plant, which is the ninth manufacturing production unit of Thermax in India, will manufacture a wide range of vapour absorption machines comprising chillers, heat pumps and heaters in its first phase. All manufacturing processes are designed to create a safe and healthy working environment, and comply with the stringent green building norms. About Thermax Limited: Thermax Limited, a leading energy and environment solutions provider is one of the few companies in the world that offers integrated innovative solutions in the areas of heating, cooling, power, water and waste management, air pollution control and chemicals. Thermax, which is headquartered in Pune, has manufacturing facilities in India, China, Europe and South East Asia. The sustainable solutions Thermax develops for client companies are environment-friendly and enable efficient deployment of energy and water resources.